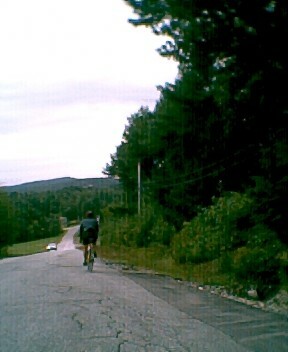 We had great weather - sunny and cool - for our ride last week in Readfield. Many thanks to Frank for the great route, and the great ride stop at the Kents Hill Orchards - the raspberry turnovers were a real treat. This Sunday Ken is leading us on a ride exploring the other side of the Belgrade Stream in Mount Vernon, followed by a hot dog roast at his house overlooking the water. We have openings in the KVBC ride calendar for leaders in September and October. If you can lead a ride, contact Jim at hjmerrick@gmail.com. Fall is coming - more great riding ahead! Delorme Maine Atlas Map 12; A-4. Just west and across the stream from the intersection of Dunn Rd and Wings Mill Rd. (Marble Point is not listed by name on the map). HIGHLIGHTS: Views of Belgrade Stream, Hamilton Pond, Stuart Pond, Messalonskee Lake, Doctor Pond, Silver Lake, Gould Pond, with a Hot Dog cookout lunch following the ride - swimming available also.